My winter project includes manual CCT mod, the R/R mod, full service and I should be good to go. Last edited by Sandyback; 12-22-2011 at 12:58 PM. OK, I'm ready to do the swap, but I have a question: is there a way to tell pos & neg on the R1 RR and does it matter what order the yellow wires plug in? I know the pix show everything wired up but I'm wanting to be certain about wire placement so I don't inflict damage to my bike. Yellow wires don't matter. Positive toward the inside, negative toward the outside. Its been discussed but maybe its because your fitting a more modern unit R/R. 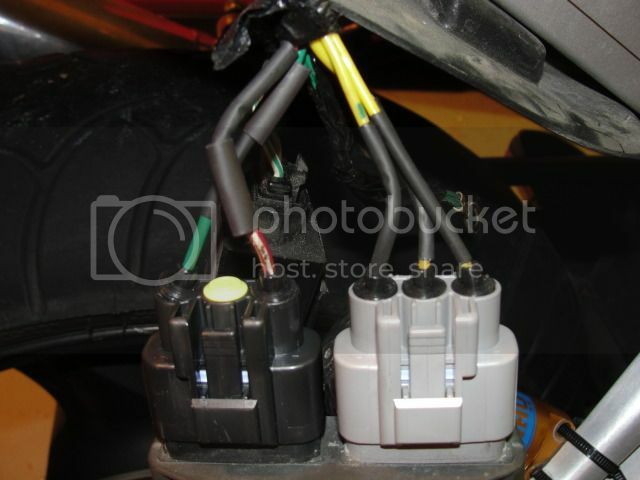 As far as i can see from a wiring diagram, the grey socket houses 3 connections for the pulse/pickup wires and the black socket houses 2 connections for the negative (+) and positive (-). The diagram below will show which order the (+) and (-) fits. This part was pricy and I don't want to blow it up or my battery and other parts. I want to be certain I'm connecting everything right! OK, now I feel totally stoooopid. I posted before I saw your reply, 7more7. Thanks for replying. It seems to reason that I would fit the wires same as oem connections, red to inside, but I want to be sure. BTW, what would be the result of reversing the power wires? (I have to plead confusion from my earlier encounter with a deer). Guess I should edit out that diagram to end confusion, yes? Last edited by Wolverine; 10-21-2014 at 06:59 AM. I think we need a clever acronym about wire color placement on the R/R. Or maybe a song. Stalactites hang tightly from the ceiling. Stalagmites MIGHT... but they don't. ^ Something along those lines. So i can run my own ground to the frame then right? Also any idea as to what could be making the voltage high? A loose connection On one of the pulse wires ? I am just trying to get a better understanding. Thanks for the info- i went with the r1 rr and the connector kit from eager beaver or whatever that site is. and.. i saved some monies as well- now- i just have to sit and wait for everything to show up- and stare at my superhawk - stranded in the garage. 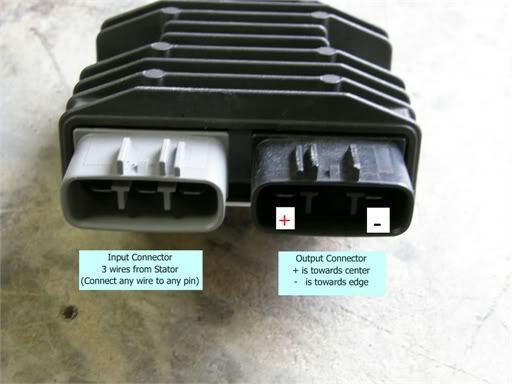 Question: the diagram above should be the same for the 04-05 zx10 regulator/rectifier i picked up, correct? Part number FH010BA. It is low profile with cooling fins, and has a 3 pin gray connector, and a 2 pin black connector. Another question. I did the r1 swap. How hot do these r/r get lets say... on a 30 min ride? Like really hot to the touch? I dont think this diagram is correct, by looking at the pictures it looks like the green goes where the red dot is on this post.. It is actually correct jonjon as stated in an earlier post somewhere. Imagine unplugging the socket and looking "up in" it. Note position of red wire and green in the black plug. Last edited by Wolverine; 10-21-2014 at 07:26 AM. So the green wire (while plugged in) is on the outside of the r/r... Right? Also are they supposed to get some what hot pretty quick? Thanks i just did mine. It has a funky plug, no idea where bouts can source one other then cutting the connector from a wiring harness. Its not an RR I have data on, so im not sure what the control circuit is, or wither it is thyristors, diodes, and MOS FETs, no idea what the rated capacity is, or if it is switched or shunt design. FH020AA / FH012AA is common, cheap used, and decent priced new, known to work well on this bike and known to be trouble free over all on all bikes it came on..they just are not known to fail... There is a lot written on the install of one making it pain free to do. Last edited by E.Marquez; 05-29-2018 at 03:14 PM. In this case, I'd stick with the FH020AA / FH012AA. The only advantage of FH022BA would have been it coming off a newer/lower mileage bike. I'm expecting it to take me about an hour. This is taking my time and making sure I get it right. This will be the first time for me to "dig into" mine, so it may take longer as I am very curious when taking things apart. I will be able to let you know exactly next week, as I am installing one that I ordered from E.Marquez.